A year long plan is intended to give you an overview of your curriculum at a glance. 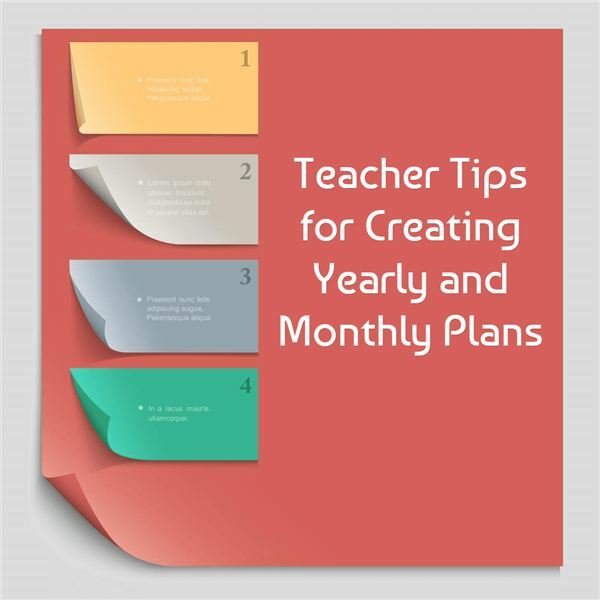 When kept in your lesson plan book, it can help you to stay on track each month in meeting the curriculum goals that you have set for the year. 1. Start by creating a blank table for your template in a word processing document. List the months, September through June in the first column. In the rows at the top of the table, list all of your content areas from your curriculum guide (for example, health, phonics, word work, spelling, social studies, science, and math). See the download below. Yearly plan templates can also be store-bought, but when the form is self-created, it is more likely to be easier to work with and utilized. The first year I did this, I used someone else’s form and I found it difficult to work with. Now it is time to start planning. Information can be typed in on the form; however, I still like to write in pencil so that I can modify my plans anywhere. Really it is a matter of personal preference. 2. Take your district’s curriculum and look at what makes sense to teach in each month. For example, a primary teacher may want to teach health themes in September. Look at the theme you would like to teach and where in the curriculum it can be covered. For example, in a Kindergarten classroom you have to teach about hand washing, rest and exercise and safety, it makes sense to teach in September, so add it to the September box. Do this for every subject for each month of the school year. 3. Once the whole curriculum has been broken down into months in this way, it will be easier to make sure that everything is covered. Check the yearly plans frequently to see if it is being followed as planned. If not, modify the plan so that it is recorded for the next school year. 4. The next step is to take the yearly plan and break it down by subject into months. 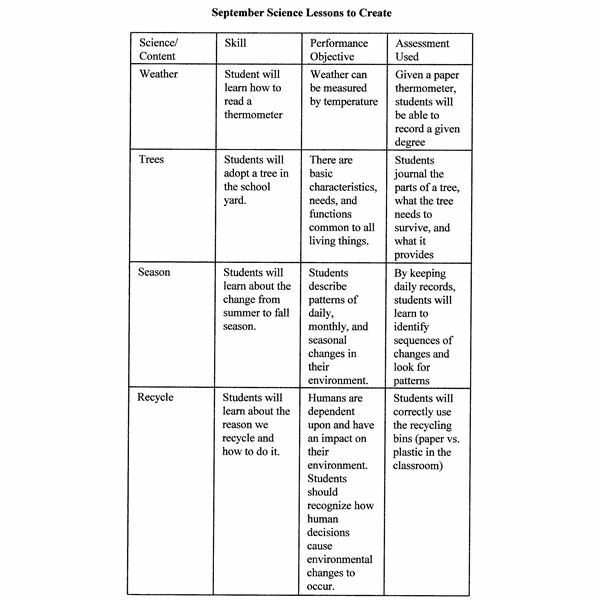 For example, for the month of September, I will teach about weather, trees, seasons, and recycling in science. 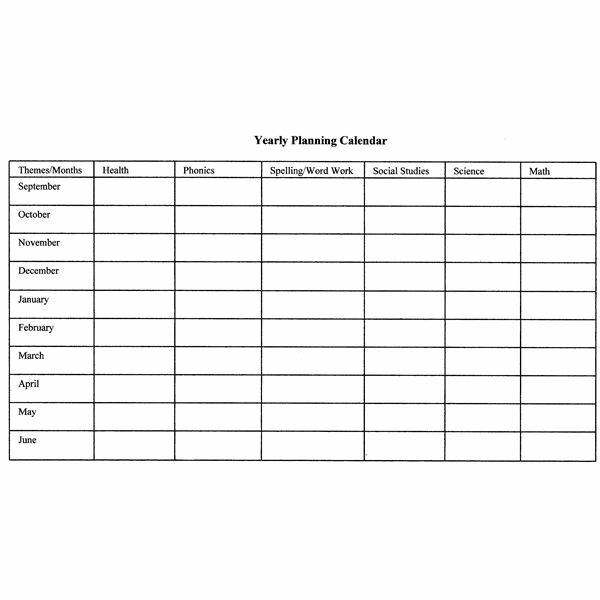 An example of a monthly plan for science is included below. Now you want to list the skills the students will be expected to learn, how it will be taught and how it will be assessed. Making a place for assessment is crucial, because instructional practices can be improved each year with the use of assessments. Continue to make a form for each subject area, listing the content, skills, objectives and assessments as shown below. 5. This may seem like a tedious process, but now it will be easier to create weekly or bi-weekly plans. You have already sketched the school year and each month to refer to, so most of the work has been done and you can be assured that you are meeting the district’s curriculum. Also it will be easier to plan for “extras,” such as projects and field trips when you can see where it fits into the curriculum. Fun projects can be justified when they meet and are an extension of the curriculum standards. Of course the style used for monthly and yearly planning is based upon personal preference. Some teachers prefer to write it out, others prefer to use computer software programs to plan, and still others prefer to create documents in Word or Excel. Ultimately, you will be happiest when you do what works best for you. Remember the saying, “make more and work less.” The better you plan now, the more time you will save in years to come.